Uzhunnu Vada (Medhu Vadai) is something that has been in my to-make list for a long time mainly because my mom and her sister are experts at this and no matter where I have it, I always crave for the home-made version. Also, this is a favourite of TH’s. For that matter, anything that’s deep fried is more his thing. Ulundu vada is a key part of any traditional festival or offering to God. While extremely simple in the ingredients that go into preparing medhu vada, it is a bit tricky to get the right consistency. If your ulundu batter becomes too runny, then it’s hard to shape the vadas (so you can just add spoonfuls to hot oil and get vadas like the last picture in this post) and if the batter is too thick, the shape will turn out well but the vadas will be hard. I am yet to master the crispy golden outer and spongy insides of a South Indian restaurant-style medhu vada but I do make a mean homemade vada that all at home enjoy. If you like South Indian snacks, then you’d definitely like these – ulli vada, aloo bonda, Mysore bonda, potato bajji recipe. Browse a list of tea time snack recipes here. 1. Soak urad dal in sufficient water for at least an hour. Drain water completely and grind to a fine paste. This is where I went slightly wrong. I added a bit of water and couldn’t shape the vadas because of that. 2. Mix in the other ingredients to make a thick batter. 3. Heat oil in a pan and shape the vadas like doughnuts. You can use your wet palms or a damp plastic bag side to do this without the batter sticking to it. I just dropped spoonfuls of the batter into the oil. 4. Fry till golden brown, adjusting the heat when the oil gets too hot. Make sure the heat is not too much cuz that will burn the outside while the inside is still undercooked. 5. Dump into a kitchen napkin to drain excess oil. Best enjoyed with coconut chutney and sambar. We had ours with carrot sambar. 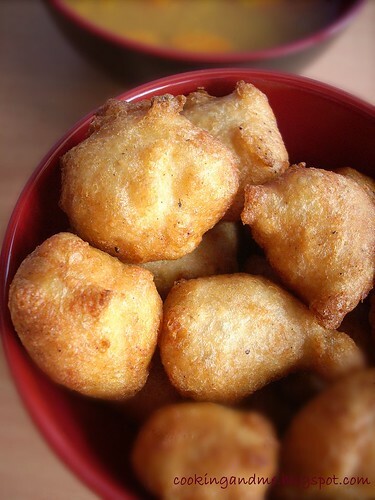 The first time I made ulundu vadai, it was hard to shape it into doughnuts so I dropped spoonfuls into hot oil. The taste is the same so don’t feel bad if you need to do the same until you get better at shaping them. It was awesome! thank you for posting it! Hey Nags…the vada looks so yummmy… and hey if you have some remaining put them into curd (chilly powder etc etc) for some delicious thayir vada! This make nice big wada with a hole, just like doughnuts, just that batter should be thick. My Urad dal vadas never turn out to be vadas, they are always bondas 😀 Looks yummy! And the tips keep coming in 🙂 Thanks Aparna! They may not have holes in the middle, but your vadas are looking real crisp. Another trick for slightly watery wada batter is to add a bit of rawa. This absorbs the water and lends to the crispness of the wada. But i wonder which is better adding rawa or rice flour? won't it turn hard when cold? Awww Nags, you made me proud. For a long time, my vadas were shapeless bondas too. As with everything else, it takes some practice and patience (underline that) to get the right shape. However pretty the shape is, it ends up to be a mishmash in our stomach. Who cares how it looks, as long its tastes good. Adding rice flour is a good tip for watery dough. There is a catch though. The vadas should be eaten while warm. Once cooled, they become very hard and chewy. Thank you for trying out the recipe. vada’s look nice n crisp. Ur pict came out so well, In TN with hole same dough called medu vadai and round shape like u did is Ullundu Bonda good with coconut chutney! I love these with Garlic chilli powder.. yummy!! Thank you for a fantastic entry. I don’t have a problem with the consistency of the finished product, just with the fact that I can’t shape the batter – not that I try hard!